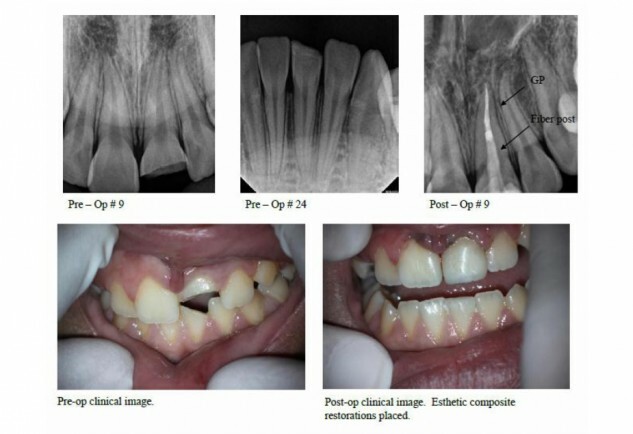 Complicated crown fracture in the esthetic zone. This 11yof had a traumatic fall, resulting in a complicated crown fracture on tooth # 9 and an uncomplicated fracture on # 24. One day of pulp exposure following the fracture caused Irreversible Pulpitis in # 9, and # 24 tested WNL to pulp sensibility testing. RCT was completed on # 9, and the tooth was restored with a fiber post and an esthetic bonded composite restoration. Tooth # 24 was restored with composite, and the occlusion was adjusted to light centric contacts without excursive interferences.